Journalism was started with the sole purpose of informing the citizens of the truth so that they can make better decisions on their lives societies and so on. Over the years however, the world has changed and in a way so has journalism. Nevertheless, the basics should always stay with every journalist past and present – Respect The Right Of Others. In the past few days, articles have popped up, written by Singaporean journalists about how athletes should talk to the media based on their performance in the competition straight after. I on the other hand believe it should not be the case. As a fellow journalist, I am dishearten by this chain of articles. We are taught to be professional, impartial and importantly ethical. I feel that it’s unethical to call out the athletes like Quah Zheng Wen who wished to remain quiet or Joseph Schooling for a comment he made. 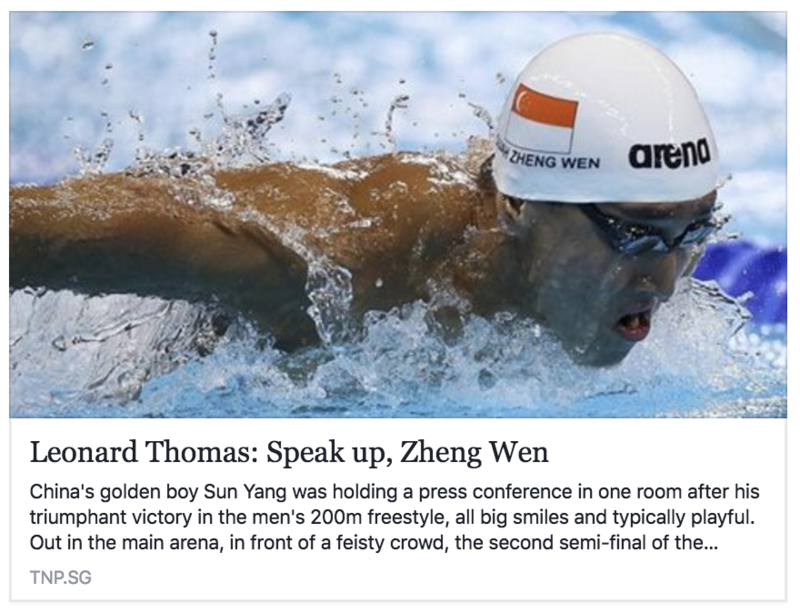 The New Paper’s Leonard Thomas and The Straits Times Rohit Brijnath called out homegrown swimmer 19 year old Quah for ignoring the media after his meet. Brijnath stated that “Talking isn’t a favour, it’s simple professionalism, it’s part of their job and ours,” while Thomas commented the fact that Quah’s Olympic journey can be a compelling tale and he should engage those who want to tell his story. Try putting yourself in their shoes for once. Would you want to speak to the media immediately after your competition, when you’ve possibly lost or just drained from using up your energy? No. You’d want to compose yourself, take a breather, think through what happened and make sense of it before speaking to the media. If they do decide to speak and mess up, they still get hate for it. After all athletes, in spite of their ungodly fitness levels, are still human. Comparing Schooling and Quah to seasoned professionals such as Phelps and Efimova – what these writers don’t seem to get is that they had years of experience to learn how to deal with media. Schooling and Quah, these boys don’t. These athletes are there to perform for their country – to do justice to their training, and not help you get the perfect quote or grab so you story could be better. 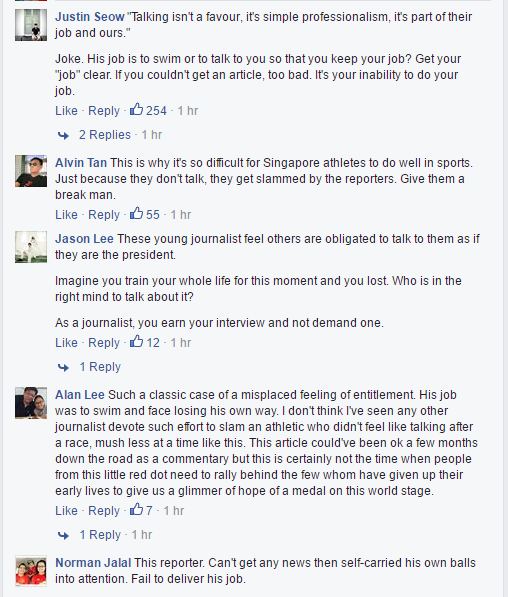 Fortunately, Singaporeans rallied and came to the defence of the swimmers. Many arguing the athletes are still young and they don’t owe the media anything. Some even added the media should be understanding and give them some time for composure before they rush over for any necessary grabs. Ever heard of the term Patience Is A Virtue? Maybe, just maybe, if you decide to give it a try and wait for them to get emotionally and physically settled, they might give you a better interview. Who knows, you might even get some unexpected information and sound bite! Give them time. That is all that is asked for. If they get the respect of having some privacy after a race, they will surely be more than willing to talk. Do unto others as would have them do unto you. Simple as that. Basic courtesy and respect if given will be reciprocated.